It is HG, not the bishops of The Society, who is “obfuscating the meaning of ‘true'”. Guiding Principle 1 requires that it be acknowledged that clergy are “the true and lawful holders of the office which they occupy.” To then speak of this as if it referred to “true validity” or “true ordination” is to fail to grasp a fundamental distinction between orders and office – a failure which indicates either mischievous misrepresentation or simple ignorance. The Principle is precisely worded, and uses the terms it does for a reason: not to provide convenient loopholes, but to say exactly what it intends to say and no more. There is no contradiction in the Principles, and no need to amend them, but simply to insist on them being applied in the sense in which they were plainly intended. Now this is really geeky Anglican stuff, not to say lawyerly ecclesial pedantry. Honestly, if you’re not an anorak, please don’t waste your time reading further. And if you belong to another denomination and want to use this analysis simply as an(other) opportunity to trash the Church of England, please don’t bother commenting at all. Note the phrase “true and lawful”: this is not merely a matter of parliamentary statute, but also of ecclesio-theological truth. Philip North (along with the rest of The Society) has no problem with ‘lawful’, but robustly refutes a crucial dimension of ‘true’. The stated aim of The Society is: “to promote and maintain catholic teaching and practice within the Church of England”; and “to provide episcopal oversight to which churches, institutions and individuals will freely submit themselves to guarantee a ministry in the historic apostolic succession in which they can have confidence”. How may this be reconciled to the first principle? Well, it can’t. If a diocesan bishop can have no confidence in the women clergy he leads, believing, as members of The Society do, that women priests and bishops are inconsistent with the apostolic tradition, in what sense can Philip North assent to the whole of the first principle without obfuscating the meaning of ‘true’? Whether his objections are ontological (that women are incapable of receiving ordination), or ecclesiological (that the decision to ordain women cannot be taken by the Church of England in isolation), his theology of leadership refutes the ‘true’ validity of their ministry. ‘None of the above’ didn’t like this at all: he takes the view that it is “either mischievous misrepresentation or simple ignorance”, because there is a “fundamental distinction between orders and office”. Members of The Society can assent unequivocally to the first principle because it distinguishes between holy orders and the office of priest/bishop: women may indeed be ordained to ministry, but “true and lawful” applies only to their office, not to their ordination. While ‘None of the above’ may not believe that nothing mischievous was intended (because it truly wasn’t), he might consider that if the reasoning was borne of ignorance, it is more the fault of a desperate and disingenuous distinction than scholarly deficiency. There is either incompetent drafting, or a purposeful obfuscation of meaning which is repugnant to common sense. If “true and lawful” relates only to a woman’s ecclesial office rather than her ordination (which The Society considers ‘lawful’ but not ‘true’), why apparently conflate the two with the phrase: “..those whom it has duly ordained and appointed to office”? Is proper (theological and legal) understanding contingent on ‘true’ as it relates to ‘lawful’, or on the relationship between the first and second half of the clause? 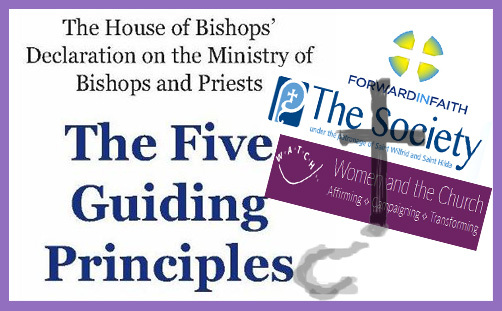 Does “Now that legislation has been passed to enable women to become bishops the Church of England is fully and unequivocally committed to all orders of ministry being open equally to all, without reference to gender..” define “..and holds that those whom it has duly ordained and appointed to office are the true and lawful holders of the office which they occupy and thus deserve due respect and canonical obedience”? The first half of the clause is concerned with all orders of ministry, but the second half restricts itself to the recognition of ‘office’ – in other words, all offices appear to be subsumed into the understanding that all ministry (and therefore orders as well since they form a constituent part of ministry) is gender blind. Hence the reasoned proposition of “true validity”, which was neither wilfully mischievous nor ignorant, but a plausible, considered interpretation of meaning. ‘None of the above’ (and The Society, and so, presumably, Bishop Philip North) takes the view that the clauses are dealing with two different categories: the first half with ministry in order to include and understand office (but exclude orders), and the second half with office qua office (but not orders). Was this clausal complexity the purposeful introduction of a crafted ambiguity, or just a happy confusion which both parties have sought to take advantage of? Since the ‘Independent Reviewer’ Sir Philip Mawer really doesn’t have a lot to write about in his report (see bottom of previous post), maybe the clausal complexity of the first principle of the Five Guiding Principles is worthy of his meticulous attention. Could he please clarify whether it purposely distinguishes between ‘office’ and ‘orders’, and rule on what the precise relationship is between ‘true’ and ‘lawful’ in the text? Over to you, Sir Philip (..with prayers).